Purpose: The high aspect ratio of carbon nanotubes (CNTs) allows the attachment of compounds that enhance the functionality of the drug vehicle. Considering this, use of CNTs as a multifunctional insulin carrier may be an interesting prospect to explore. Materials and methods: The carboxylic acid groups were functionalized on the sidewalls of single-walled CNTs (SWCNTs) followed by diimidation to form amide bonds with the amine groups of the insulin. Results: Scanning transmission electron microscopy and transmission electron microscopy establish clear conjugation of insulin onto the surface of nanotube sidewalls. The incorporation of insulin further increased the solubility of SWCNTs in biological solution for the tested period of 5 months. Bicinchoninic acid assay confirms that 0.42 mg of insulin could be attached to every 1 mg of carboxylated SWCNTs. Conclusion: With the successful conjugation of insulin to SWCNTs, it opens up the potential use of SWCNTs as an insulin carrier which in need of further biological studies. Carbon nanotubes (CNTs) are highly versatile materials due to their remarkable mechanical, thermal, and electronic properties. As a result, they have been used for applications across many different technological areas. Among the recently explored applications is the use of CNTs as multifunctional drug carriers. The high aspect ratio of CNTs means that it is possible to attach not only drug molecules but also other compounds that impart desired functionalities. Expanding on this, the use of CNTs as a multifunctional insulin carrier may be an interesting prospect to explore. As mentioned earlier, the high aspect ratio of CNTs means that it is possible to attach a variety of compounds that will improve the functionality of the carrier. As an example, for the oral route, CNTs that are used as insulin carriers may be functionalized with mucoadhesives, absorption enhancers, or enzyme inhibitors to help delivering the attached insulin through the gastrointestinal tract.19 CNTs were also used as insulin vehicles in targeted delivery systems to concentrate the dose at specific sites of pharmacological action through the use of sodium glychocholate.18 In short, there are many possible avenues for development with regard to the applications of CNTs as multifunctional insulin carriers. In this investigation, the conjugation of insulin onto the sidewalls of functionalized single-walled CNTs (SWCNTs) through their esterified carboxylic groups has been attempted. The approach and the mechanism behind the utilization of carboxylic groups on the SWCNT surface for the attachment of amino groups of insulin have been elucidated. Scanning transmission electron microscopy (STEM) and transmission electron microscopy (TEM) imaging were used to visualize the synthesized conjugates of SWCNT–insulin that were purified through dialysis. To estimate the amount of insulin attached to the SWCNT, a bicinchoninic acid (BCA) assay was conducted on the synthesized conjugates and their absorbance was then measured using ultraviolet (UV)–visible spectrophotometer. Phosphate buffers of pH 6.0 and 7.6 were prepared by adding 5.7 mL and 42.8 mL of 0.2 M NaOH, respectively, into an aqueous solution of 50 mL of 0.2 M potassium dihydrogen phosphate (KH2PO4; Merck & Co., Inc., Whitehouse Station, NJ, USA). The mixture was then diluted to 200 mL using ultrapure water obtained from a Millipore Milli-Q device before storing for future use. SWCNTs (>95% purity; Sigma-Aldrich Co., St Louis, MO, USA) with 0.7 nm in diameter and 100 nm in length were functionalized with carboxylic groups by following our previously reported protocol.24 Briefly, SWCNTs were sonicated in an acid mixture for 8 hours. Then, 10 mg of these carboxylated SWCNTs were added into 5 mL of phosphate buffer with pH 6.0. The mixture was sonicated in an ultrasonic bath (Elma TI-H-15, 200 W, 35 kHz) for 2 hours to fully disperse the nanotubes. Following this, 3 mL of 0.05 M N-hydroxysulfosuccinimide (S-NHS; Thermo Fisher Scientific, Waltham, MA, USA) solution was added into the dispersed SWCNT suspension under gentle stirring before the addition of 1 mL of 0.02 M 1-ethyl-3-(3-dimethylaminopropyl)carbodiimide hydrochloride (EDC; Thermo Fisher Scientific) solution. The mixture was then sonicated for 15 minutes and reaction was carried out on an orbital shaker (Unimax 1010, Heidolph, Nuremberg, Germany) for 1 hour at 270 rpm. The mixture was subsequently vacuum filtered through a polyethersulfonate (Sartorius, Goettingen, Germany) membrane using a Buchner funnel. The resulting filter cake, ie, diimide-activated SWCNTs were washed thoroughly to remove the excess EDC and NHS before resuspending it in a pH 7.6 phosphate buffer. Ten milligrams of human recombinant zinc insulin (Merck & Co., Inc.) was dissolved in 2 mL of pH 7.6 phosphate buffer. The resuspended diimide-activated SWCNT mixture was sonicated briefly in an ultrasound bath before the quick addition of the insulin solution. The diimide-activated SWCNT–insulin mixture was then left to react for 3 hours on an orbital shaker at 180 rpm. Following this, the mixture was centrifuged at 4,500 rpm for 1 minute to remove the unreacted SWCNTs. The supernatant was dialyzed using a cellulose membrane tubing (Sigma-Aldrich Co., St Louis, MO, USA) for 4 days to remove the unbound insulin. For the dialysis process, 0.005 M KH2PO4 buffer was used as dialysate for the first 3 hours before changing to ultrapure water. The dialysate was changed three times a day to maintain the diffusion force across the membrane. Dialysis was conducted between 10°C and 12°C overnight using refrigerant gel packs to minimize the degradation of protein. All BCA assay studies were conducted using a BCA Protein Assay Kit (Thermo Fisher Scientific), while the absorbance of the reacted samples was measured using a UV–visible spectrophotometer (Perkin Elmer Lambda 35; PerkinElmer Inc., Waltham, MA, USA). The absorbance–concentration calibration curve was generated using bovine serum albumin (BSA) standards (Thermo Fisher Scientific). After adding the reagents from the BCA Protein Assay Kit, the samples were incubated for 30 minutes before measuring the absorbance at 562 nm. The conjugated samples were dropped on formvar–carbon-coated copper grids before staining with 3% phosphotungstic acid for 2 minutes. The grids were then left to dry sufficiently before subjecting to TEM (LEO 912AB TEM, Zeiss, Oberkochen, Germany) and STEM (FEI Quanta 650 SEM; Hillsboro, Oregon, USA) imaging. Pristine CNTs are inherently insoluble in organic solvents, thus chemical manipulation becomes difficult. The functionalization with carboxylic acid groups helps mitigate this disadvantage by affording the possibility of further chemical derivatization. From our previous report,24 the percentage of carboxylation is 6.58 for every 36.1 mg of CNT. The functionalized carboxylic acid groups on the sidewalls of CNTs were used as a precursor for diimidation to form amide bonds with the amine groups of the insulin. This was achieved through the reaction of carboxylic acid groups with EDC and S-NHS to form an amine-reactive ester group. Similar technique had been successfully employed to attach proteins such as BSA as well as ferritin.25,26 The EDC/S-NHS activation method was preferred due to its high conversion efficiency and excellent biocompatibility, which minimizes any adverse effects on the bioactivity of target molecules.27,28 The reaction pathway for the conjugation of insulin onto SWCNTs is shown in Figure 1. Figure 1 Reaction pathway for the formation of insulin-conjugated SWCNT. Abbreviations: EDC, 1-ethyl-3-(3-dimethylaminopropyl)carbodiimide hydrochloride; S-NHS, N-hydroxysulfosuccinimide; SWCNT, single-walled carbon nanotube. As seen in Figure 1, the EDC reacts with the −COOH groups on the SWCNT defect sites to form an amine-reactive O-acylisourea intermediate. However, this intermediate is unstable and can easily be hydrolyzed to regenerate the same carboxylic groups. The addition of S-NHS helps to increase the stability and coupling efficiency by reacting with the O-acylisourea groups to form amine-reactive NHS-ester groups which can be stable for hours.27 The latter can then be used to react with amine groups of the insulin molecule to form stable amide cross-links. The result is a stable covalent bond between the functionalized SWCNT and the target insulin molecule. The addition of insulin to the SWCNT buffer mixture also seems to aid in the solubility of SWCNTs in salt buffers. The functionalized SWCNTs are soluble in water for 45 days24 and typically not soluble in phosphate buffers that settle to the base of the reaction chamber over time. This is likely due to the heavy concentration of salt that may interfere with the deprotonation of the carboxylic groups. It is hypothesized that the addition of insulin, which is readily soluble at phosphate buffers of high pH, negates this effect, thereby allowing the solubilization of the SWCNTs. In addition, the presence of abundance of amine groups in insulin could have formed a weak hydrogen bond with water and phosphate buffers, which aids further solubilization of SWCNTs. This effect was noticed from the formation of a dark homogeneous solution and was stable up to the tested period of 5 months. To remove any unbound insulin after the reaction, the reaction mixture was subjected to a dialysis process for 4 days. During dialysis, a serial dilution of the dialysate (10× dilutions) was made after each buffer change. This is to prevent a sharp increase in the osmotic pressure, which may cause the dialysate to enter and rupture the cellulose membrane tubing. In addition, the dialysate was stirred using magnetic stirring to increase the dialysis rate. The dialysis was conducted at a lower temperature (~8°C–10°C) overnight to minimize the protein degradation. STEM and TEM imaging were conducted on pure insulin and insulin-conjugated SWCNTs to visualize and to confirm the attachment of insulin to the SWCNT surface. As insulin is nonconductive and would therefore be invisible under electron microscope imaging, it is necessary to first stain the samples with 3% phosphotungstic acid before imaging. STEM images of pure insulin (Figure 2) shows that the particle size of insulin is in the region of 80–200 nm. The images, in general, also confirm that the insulin proteins spread evenly within the phosphate buffer. Figure 2 STEM images of pure insulin and insulin-conjugated SWCNTs. Notes: STEM images of insulin stained with phosphotungstic acid with (A) lower and (B) higher magnification. STEM images of insulin-conjugated SWCNTs stained with phosphotungstic acid with (C) lower and (D) higher magnification. Abbreviations: STEM, scanning transmission electron microscopy; SWCNTs, single-walled carbon nanotubes. A comparison of the STEM images of insulin with the insulin-conjugated SWCNT confirms the affinity and attachment of insulin on the sidewalls of functionalized and diimide-activated SWCNTs (Figure 3), while the relatively dispersed pure insulin can be seen in Figure 2. For a higher resolution image of the conjugation of insulin onto individual CNTs, TEM imaging was conducted using the same staining method. 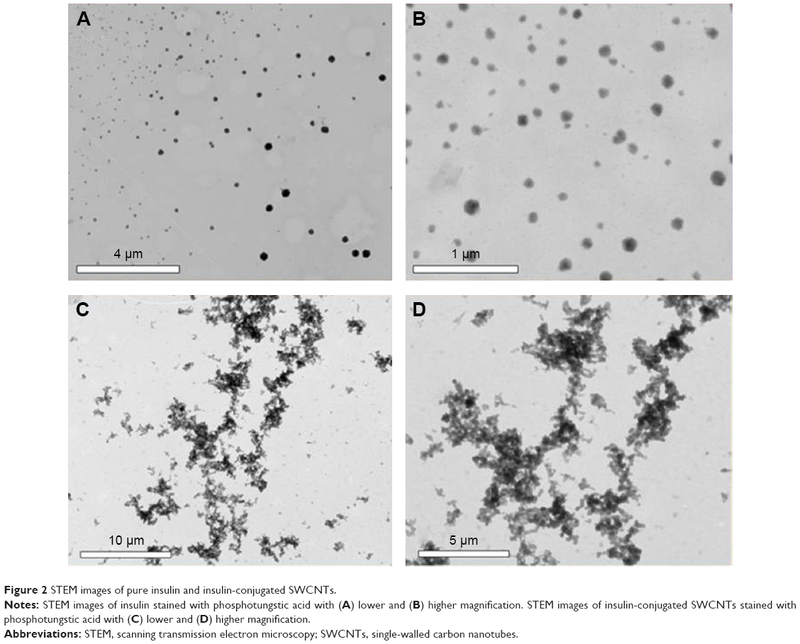 Figure 3 TEM images of pure insulin and insulin-conjugated SWCNTs. Notes: (A) and (B) TEM images of insulin stained with 3% phosphotungstic acid at different magnifications. (C–F) TEM images of insulin-conjugated SWCNTs stained with phosphotungstic acid at various magnifications. Abbreviations: TEM, transmission electron microscopy; SWCNTs, single-walled carbon nanotubes. The TEM images of pure insulin as shown in Figure 3A and B confirm that the insulin molecules are approximately 80–200 nm in size. The image depicts the natural spherical conformation of the insulin molecule in acidic conditions, while the dark color is a result of the phosphotungstic acid stain enveloping the insulin molecule. Based on the comparison of the TEM images of insulin and insulin-conjugated SWCNTs, it can be clearly seen that the insulin molecules have conjugated onto the surface of individual CNTs. It is also important to determine the amount of insulin molecules that were conjugated onto the functionalized and diimide-activated SWCNTs. For this, the purified SWCNT–insulin samples were analyzed using a BCA protein quantitation assay. In this assay, the BCA chelates with the Cu+ ions that have been reduced by the insulin molecules to effect a color change from light green to dark purple. The magnitude of the color change from the BCA–Cu+ product has been found to strongly correlate with the actual amount or concentration of insulin present in the SWCNT–insulin sample. Before measuring the BCA absorbance, an absorbance–concentration calibration curve was plotted using the absorbance measurements from BSA standards. The absorbance–concentration curve as shown in Figure 4A was then used to determine the protein concentration of the samples from the measured absorbance at 562 nm. Figure 4 Calibration curves of insulin and estimation of insulin content in SWCNTs after dialysis. Notes: (A) Absorbance–protein concentration response curve obtained using BSA standards, and absorbance was measured at a wavelength of 562 nm. (B) UV–visible absorbance measurements of the samples using BCA assay of (a) pure insulin, (b) SWCNT–insulin before dialysis, (c) 2 days dialysated SWCNT–insulin, (d) 4 days dialysated SWCNT–insulin. Abbreviations: BCA, bicinchoninic acid; BSA, bovine serum albumin; SWCNT, single-walled carbon nanotube; UV, ultraviolet. In this study, four samples were analyzed: pure insulin, SWCNT–insulin before dialysis, 2 days dialysated SWCNT–insulin, and 4 days dialysated SWCNT–insulin. The measured absorbance curves for all the aforementioned four samples are shown in Figure 4B. The peak absorbance values at 562 nm were then used to estimate the protein concentration of the samples using the calibration curve (Figure 4A), and the corresponding results are shown in Table 1. Abbreviations: BCA, bicinchoninic acid; SWCNT, single-walled carbon nanotube. The observed protein quantitation results show that the concentration of pure insulin was 1.95 mg/mL. The result is in agreement with the theoretical value of 2 mg/mL. The overall protein concentration of the SWCNT–insulin samples before dialysis reduced to 1.90 mg/mL after the centrifugation process that was carried out to remove the unreacted SWCNTs. Following the dialysis for 2 days, the insulin concentration further decreased to 0.49 mg/mL. The rate of insulin diffusion was only reduced to 0.42 mg/mL even after dialysis for a further 2 days. It is thus safe to assume that most of the unbound insulin had been removed from the SWCNT–insulin solution. Based on this, for each milligram of diimide-activated SWCNT, ~0.42 mg of insulin was conjugated. Therefore, the number of insulin molecules attached per milligram of diimide-activated SWCNT is 4.3×1016. It should be noted that as the unbound insulin purification might not be complete, the actual amount of conjugated insulin should be slightly lower than the amount reported for samples after 4 days of dialysis. If necessary, there are few possible methods that can be used to control the conjugation efficiency and hence the amount of insulin that could be attached onto the sidewalls of SWCNT. For example, the number of carboxylic groups on the functionalized SWCNTs can be controlled during the functionalization process. In addition, the ionic strength of the buffer used during the conjugation of insulin onto the sidewalls of SWCNT may also have an effect on the amount of attached insulin,28 where the adjustment of ionic strength could be performed by varying the pH of the buffer used in the amidation process. Insulin was successfully conjugated on the surface of functionalized SWCNTs through the formation of amide bonds with the esterified carboxylic groups. The unbound insulin was largely removed through dialysis using cellulose membrane tubing. The addition of insulin aided in the solubility of the SWCNTs in phosphate buffer that might enhance its biocompatibility. STEM and TEM images showed the clear attachment of insulin onto the surface of SWCNTs. From the BCA assay, it was found that ~0.42 mg of insulin was conjugated for every 1 mg of carboxylated and diimide-activated SWCNTs. The results of this study represent an interesting first step toward the potential use of SWCNT as insulin carriers and the high aspect ratio of SWCNTs may allow the conjugation of other molecules such as mucoadhesives, enzyme inhibitors, or absorption enhancers and thus SWCNTs could be used as multifunctional insulin carriers. The authors would like to thank Fundamental Research Grants Scheme for the funding support (FRGS/1/2013/SG05/UNIM/01/1). Maeda H, Wu J, Sawa T, Matsumura Y, Hori K. Tumor vascular permeability and the EPR effect in macromolecular therapeutics: a review. J Control Release. 2000;65(1–2):271–284. Liu Z, Chen K, Davis C, et al. Drug delivery with carbon nanotubes for in vivo cancer treatment. Cancer Res. 2008;68(16):6652–6660. Feazell RP, Nakayama-Ratchford N, Dai H, Lippard SJ. Soluble single-walled carbon nanotubes as longboat delivery systems for platinum (IV) anticancer drug design. J Am Chem Soc. 2007;129(27):8438–8439. Liu Z, Cai W, He L, et al. In vivo biodistribution and highly efficient tumor targeting of carbon nanotubes in mice. Nat Nanotechnol. 2007;2(1):47–52. Liu Z, Sun X, Nakayama-Ratchford N, Dai H. Supramolecular chemistry on water-soluble carbon nanotubes for drug loading and delivery. ACS Nano. 2007;1(1):50–56. Dhar S, Liu Z, Thomale J, Dai H, Lippard SJ. Targeted single-wall carbon nanotube-mediated Pt(IV) prodrug delivery using folate as a homing device. J Am Chem Soc. 2008;130(34):11467–11476. McDevitt MR, Chattopadhyay D, Kappel BJ, et al. Tumor targeting with antibody-functionalized, radiolabeled carbon nanotubes. J Nucl Med. 2007;48(7):1180–1189. Pastorin G, Wu W, Wieckowski S, et al. 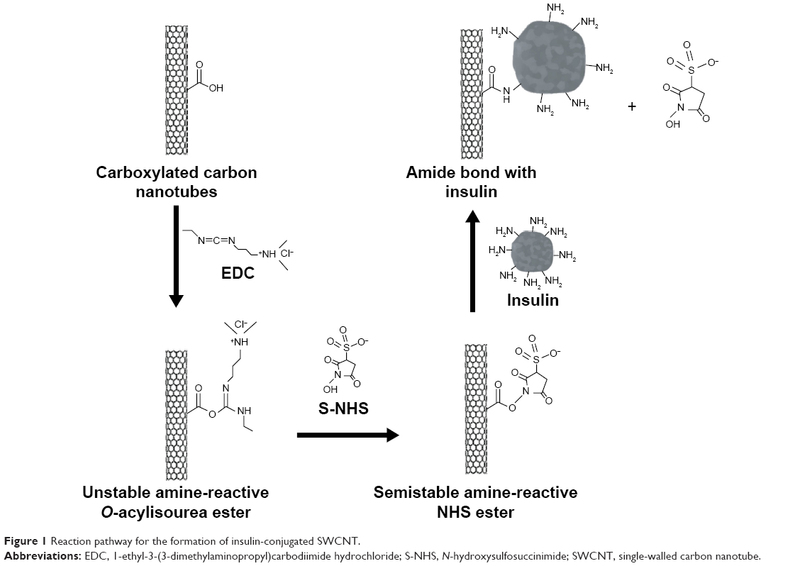 Double functionalization of carbon nanotubes for multimodal drug delivery. Chem Commun. 2007;11:1182–1184. Wu W, Wieckowski S, Pastorin G, et al. Targeted delivery of amphotericin B to cells by using functionalized carbon nanotubes. Angew Chem Int Ed. 2005;44(39):6358–6362. Singh R, Pantarotto D, McCarthy D, et al. Binding and condensation of plasmid DNA onto functionalized carbon nanotubes: toward the construction of nanotube-based gene delivery vectors. J Am Chem Soc. 2005;127(12):4388–4396. Murugesan S, Park TJ, Yang H, Mousa S, Linhardt RJ. Blood compatible carbon-nanotubes-nano-based neoproteoglycans. Langmuir. 2006;22(8):3461–3463. Baker SE, Cai W, Lasseter TL, Weidkamp KP, Hamers RJ. Covalently bonded adducts of deoxyribonucleic acid (DNA) oligonucleotides with single-wall carbon nanotubes: synthesis and hybridization. Nano Lett. 2002;2(12):1413–1417. Kam NW, Liu Z, Dai H. Functionalization of carbon nanotubes via cleavable disulfide bonds for efficient intracellular delivery of siRNA and potent gene silencing. J Am Chem Soc. 2005;127(36):12492–12493. Shi Kam NW, Jessop TC, Wender PA, Dai H. Nanotube molecular transporters: internalization of carbon nanotube-protein conjugates into mammalian cells. J Am Chem Soc. 2004;126(22):6850–6851. Pantorotto D, Partidos CD, Graff R, et al. Synthesis, structural characterization and immunological properties of carbon nanotubes functionalized with peptides. J Am Chem Soc. 2003;125(20):6160–6164. Tisch R, McDevitt H. Insulin-dependent diabetes mellitus. Cell. 1996;85(3):291–297. Fauci AS, Hauser BL, Dan LL, Lolscalzo J. Harrison’s Principle of Internal Medicine. New York, NY: McGraw-Hill; 1998:2289–2290. Khafagy ES, Morishita M, Onuki Y, Takayama K. Current challenges in non-invasive insulin delivery systems: a comparative review. Adv Drug Deliv Rev. 2007;59(15):1521–1546. Carino GP, Mathiowitz E. Oral insulin delivery. Adv Drug Deliv Rev. 1999;35(2–3):249–257. Gracian T, Panyala NR, Havel J. Carbon nanotubes: toxicological impact on human health and environment. J Appl Biomed. 2009;7:1–13. Pantarotto D, Briand JP, Prato M, Bianco A. Translocation of bioactive peptides across cell membranes by carbon nanotubes. Chem Commun. 2004;1:16–17. Vardharajula S, Ali SZ, Tiwari PM, et al. Functionalized carbon nanotubes: biomedical applications. Int J Nanomedicine. 2012;7:5361–5374. Wang R, Mikoryak C, Li S, et al. Cytotoxicity screening of single-walled carbon nanotubes: detection and removal of cytotoxic contaminants from carboxylated carbon nanotubes. Mol Pharm. 2011;8(4):1351–1361. Ng CM, Manickam S. Improved functionalization and recovery of carboxylated carbon nanotubes using the acoustic cavitation approach. Chem Phys Lett. 2013;557:97–101. Huang W, Taylor S, Fu K, et al. Attaching proteins to carbon nanotubes via diimide-activated amidation. Nano Lett. 2002;2(4):311–314. Jiang K, Schadler LS, Siegel RW, Zhang X, Zhang H, Terrones M. Protein immobilization on carbon nanotubes via a two-step process of diimide-activated amidation. J Mater Chem. 2004;14(1):37–39. Wang C, Yan Q, Liu H-B, Zhou X-H, Xiao S-J. Different EDC/NHS activation mechanisms between PAA and PMAA brushes and the following amidation reactions. Langmuir. 2011;27(19):12058–12068. Jans H, Jans K, Stakenborg T, et al. 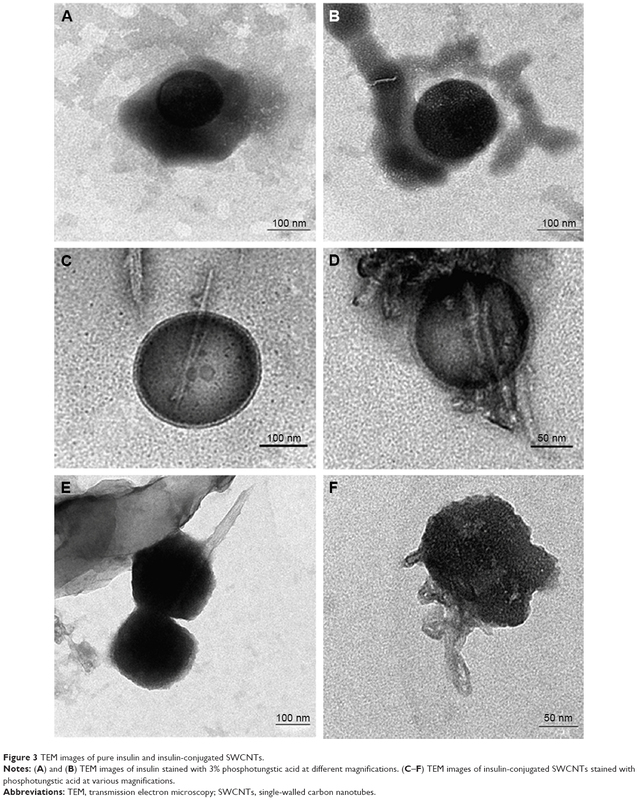 Impact of pre-concentration to covalently biofunctionalize suspended nanoparticles. Nanotechnology. 2010;21(34):345102. Blundell T, Dodson G, Hodgkin D, Mercola D. Insulin: the structure in the crystal and its reflection in chemistry and biology. Adv Protein Chem. 1972;26:279–402. Hinds KD, Kim SW. Effects of PEG conjugation on insulin properties. Adv Drug Deliv Rev. 2002;54(4):505–530.